Many people have skin tags which are tiny knob of skin that protrudes from the surface of your skin. They are usually benign and typically show up in the more sensitive areas of the body such as the eyelid, face, neck, underarms or groin area. Skin tags are often the same color as the skin that surrounds it but on occasion they do appear darker. Skin tags are not related to any illnesses or diseases. They naturally form and cannot be prevented. Some people are just prone to these growths; some common causes are: pregnancy, heredity, weight gain, and age. Once you have a skin tag it is permanent, and although it may grow, it will not become cancerous. Skin tags are usually not dangerous or painful, but there are several reasons that many people want to have them removed. 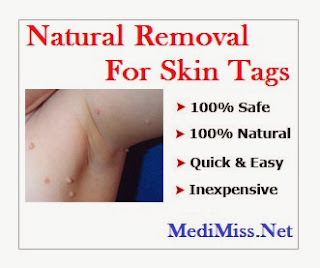 Reasons to try skin tags removal methods are as follows. Clothing irritates skin tags and they are getting caught in jewelry or zippers. In addition, they are in an obvious place and are causing embarrassment. What's more, multiple tags have shown in one place causing an unattractive mass. In many cases people choose to have a doctor remove these growths in the office without much muss or fuss because it is easier than dealing with the issue at home on your own. However, what you run into in this case is problems with the insurance company not wanting to pay because it's basically an elective or cosmetic procedure which they don't deem to be necessary or life threatening. The doctor will usually freeze the tag and it will fall off in a number of days. In recent years some products have shown up on the market that allow you to freeze them yourself at home, and this is a great way to address the issue. Remember that these products, although fine for very small tags, are not as powerful as what your dermatologist would use, so you may not be able to use them on larger areas. If you are one of the many people plagued by these unsightly blemishes, there are ways to remove a skin tag by yourself without going to the doctor, but you must use care when doing so. Many of these methods are painless, but you may find that a few cause a bit of stinging. If the skin tag is painful or if you cannot move it, it is not recommended that you try to remove it on your own. It could be infected, and removal could cause more pain and problems. All manner of home methods have shown up over the years, and some work just fine if you are not the squeamish type. For example, many folks just snip them off with a pair of scissors or nail clippers. Other people find they fear pain or bleeding, so they might try the thread approach where you simply tie a piece of string or thread around the tag and wait for it to fall off. These methods work in a lot of cases but be very sure to use sterile technique so you won't find yourself with an infection, thereby necessitating a trip to the doctor after all. Also, have something on hand to stem the blood flow if you plan to try snipping. So basically it is not usually dangerous to try to remove a skin tag by yourself, but keep in mind that there are still some occasions when seeing your physician is the best alternative in the long run. If these methods do not work for you, there is always the option of consulting with a dermatologist, to discuss another option to remove skin tags. CURED uses an all natural approach. Simply apply directly to the skin tag and cover it lightly. This procedure is usually pain free. SkinTagCure relies on a blend of herbs, and mineral salt to dissolve skin tags. It is a new all natural, certified organic topical treatment that works quickly to eliminate skin tags. Its effectiveness against skin tag is supported by published scientific studies. Whether skin tags have recently appeared or have been present for years, SkinTagCure acts quickly to eradicate even the most chronic or acute conditions. It is important to note that this high-quality product is undiluted and unadulterated -- it contains strictly certified organic pharmacological plant extracts, which have the proven ability to eradicate skin tags and skin tumors quickly. The extracts are harvested and distilled by hand for medicinal use -- they are pure and complete. This is critical when treating any infection on the skin. SkinTagCure has eliminated skin tags on patients of all ages with symptoms ranging from dramatically acute to mild but chronic. In almost all known cases, SkinTagCure quickly and effectively eliminated skin tags without any tissue damage, scarring, or recurrence.